God calls us to get our hands dirty in our own community. Our faith family is engaged in the Salisbury community seeking to make a difference in education, hunger and homelessness. Provide dinner and assist with laundry and clean-up on the second Wednesday night of each month, provide breakfast the following morning. Bag-a-Month: Bring a bag full of groceries to the narthex the first Sunday of each month. Buck-a-Meal: A special offering of loose $1 bills is collected the first Sunday of each month in the Buck-a-Meal program. All $1 bills in the offering plate are given to RHM. We often say that if you want to see the future of Salisbury, look at Knox Middle School. 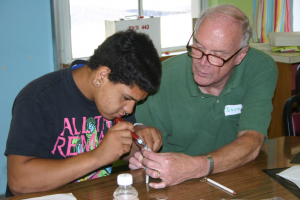 We are actively engaged in this school through tutoring, food programs and an innovative afterschool program. Food for Thought: Each week of the school year 11 food bags are delivered to hungry sixth-graders at Knox. The food is provided in partnership with the non-profit, Food for Thought. The bags are packed and delivered by volunteers each week. St. John's participates in packing parties throughout the year - check the calendar for dates. Barnabas Connection: In collaboration with the Center for Faith and the Arts, the "Leonardo Meets Barnabas" program reaches out to at-risk youth at Knox Middle School by connecting them to community artists and other adult mentors from St John's. The weekly program, 3:30-5:30 pm Thursdays during the school year, shares the gospel through the words, art, and actions of the leaders. Students try their hand at some advanced artwork, including pottery, stained glass and mosaics. The student’s final event is an art show hosted at Pottery 101. For more information contact Nancy Gaines at ngaines@fibrant.com. We know that they measure anticipated prison spaces needed based on an areas literacy rates — especially of 3rd graders. At St. John’s, we are committed to making an impact on 3rd graders who struggle to read. Each week tutors meet with students at Isenburg Elementary School for two-hours each week to read, practice writing, and comprehension skills. We invite you to volunteer one to two hours a week and make an impact on the lives of these students. 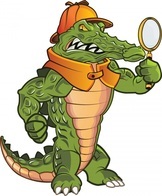 Join our Gator Reading Club by contacting Karen Puckett at karen.puckett@rss.k12.nc.us. Gary Rhodes leads this burgeoning ministry providing pre-release mentoring, post-release relationship and support for citizens returning to society following a period of incarceration. The ministry includes training and support for mentor-volunteers and safe, supporting relationships for protege-returning citizens. St. John's sponsors this ministry in partnership with the NC Department of Corrections - Division of Chaplains and as the local incubator/hub for other organizations and faith-communities also wishing to partner with us in this effort. Both male and female mentor-volunteers are needed. St John's volunteers deliver hot meals to the homebound the 1st & 2nd Wednesdays of each month. If you are interested in getting involved, please contact Elaine Gerst or Amy Ritchie.